Well look at you, you are a world traveller. There are so many sights to see in the world and you do not want to settle for the dreary sights of the hometown blues. We do not blame you, its a natural feeling. But you have a problem. You like to smoke. A lot. You know this had to be it. Its the number one stoner destination in the whole world. The fact is that the laws concerning toking up are lax and comfortable. You can head to a coffee shop and be blazing within 20 minutes. And it doesn’t hurt that other substances are legal there as well. Ultimately, there was no way that this stoner paradise could be beat out for the number one spot. Its just the perfect storm. Perhaps a more surprising one, Barcelona is one of those stoner cities that keeps it a little more underground. But really its just under the surface. You can’t just buy bud by walking into any store, but its not too difficult either. They have collectives that allow legal weed, and, more importantly Spannibus, the biggest weed gathering in Europe. Its also one of the most fun cities in the world for its nightlife. Canada was not going to be overlooked forever. Luckily, our hometown of Vancouver is a perfect destination for the economical stoner. Now, we know its not very far to travel, if at all, but it does have many of the amenities of the other cities. Our bud is great, our community is great and you will find plenty of activism and great places to toke up. 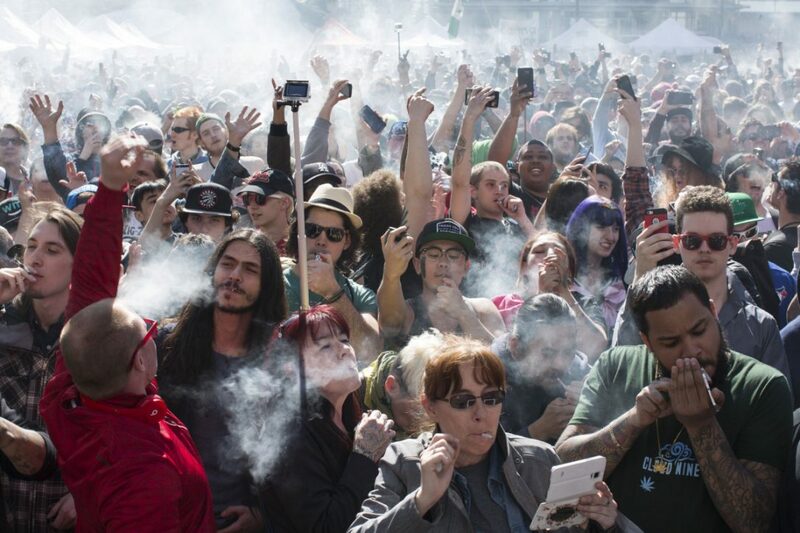 From the looks of the above picture, they might not need much more smoke, but Berlin is the hipster capital of the world, and hipsters love bud. Berlin is a haven for stoners and it made it onto this list because of its amazing community as well as its leniency. Go smoke and hang out in the park. Another fun thing about Berlin is the ability to drink beer on the street, which we absolutely recommend. Grab a beer, a pretzel, and a joint and get out there! We know, you were hoping America would miss out. Us too. But unfortunately its hard to exclude the blue waters of California. Its just a fun place to go. You may have heard the saying “Women, Weed, and Weather.” California has it all and Los Angeles is the embodiment of that idea. Head out there in the dead of winter for a real escape. Canada is having a strong showing on this list (no such thing as hometown bias) and it has to do with its laws. Toronto is just a fun place to hang out and smoke some. We love the atmosphere and hanging out in Kensington Market after smoking a join. Visit for a more affordable trip. The whole country of Jamaica probably deserves to be on this list, but we’ll settle for the city that most signifies the laid back nature of its wonderful inhabitants. You will hear the Bob Marley tunes blasting and smell the dank air and know you are home. It is sad that the island is beset by serious financial difficulties, but it is definitely worth it to stop by. Here is one that you might not have thought of. Its not the largest of cities in New Zealand but it is one of the most beautiful. If you can picture yourself with a nice pipe of loud as you stare out on grassy fields, then this is the place for you. It doesn’t hurt that this is where the Lord of the Rings was filmed so you have a built in destination already (if you haven’t seen these masterpieces, stop reading this list, roll up a blunt and watch immediately!). The US can’t help but scoring again. This time its another west coast city but much farther north. Portland is another hipster haven and is full of people who just want to smoke and grow their organic gardens. The food, the lifestyle, the culture, its almost as if it was all created just for stoners like you. Don’t scoff until you have seen the lifestyle and tried a bit of the easy life for yourself. The only South American city to make it on this list, Montevideo is a true paradise. Weed has grown incredibly easy to grow and obtain. Its a delightful place full of culture and excitement, and vastly different than the traditional stoner destination. You will absolutely love the food, so we recommend combining your two passions. Smoke a blunt and then check out one of the cities’ many local restaurants. And there you have it. Put together a travel list and get packing. The world is waiting for you to explore these cities and report back. We want your feedback. There is no time to waste if you want to see the entire world. So good luck out there. Let us know what you think, so we can live vicariously through you. So get out there, and keep toking!